The prestige and extraordinary reputation of Heroes is something that has already transcended other elements in the movie industry, as much as it has already done so in the gaming industry. Even the gambling sector hasn't been spared with its exploding popularity that's continuously expanding even in our generation. With such an exquisite popularity behind its theme, it is definitely the perfect theme to exploit for software developers of the waging world, even one of the biggest - Microgaming. However, when thinking of heroes, more often than not, people think about super-powered individuals with stellar yet comical costumes. The brand takes this common theme, bringing with it an orient flavor that has truly made the 108 Heroes Multiplier Fortune Slot machine unique throughout the ages. The no download 108 Heroes Multiplier Fortune free play slot demo in this page, can provide you with a pretty good view of what this game has in store for players, with the convenience of no registration needed. When thinking about heroes of the orient, don't incorporate them with those adult individuals wearing vibrant costumes or those who wear spandex on top of their fit clothes. 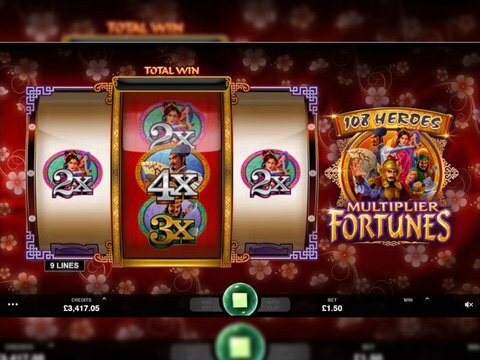 Although there's a flare to them that captivates users, the gallant, ardent and ever-so glorious vibe of the Heroes in the 108 heroes Multiplier Fortune, is truly something that can invoke a whole new feeling inside of you as you spin its reels. The game may sound so innovative and otherworldly but venturing in its dimension, you'll immediately realize that it will take you by surprise with its classical reels. There's a 3-reel and 9-payline structure, neatly placed at the center spot of the game, backed up by an elegant, ephemeral and stunning red background with cherry blossoms making up an exquisite pattern. There's also the title placed beside the gaming reels while at the bottom lies the intuitive, simple yet stunning control system of the game. You can bet a neat 30 coins per spin or even up your ante by a wide leap of up to $150 per spin. Despite taking a classic approach, the game's jackpot and rewards are no way inferior to latest games. There are classic 7s and bar symbols with different colors and prizes with the red 7s paying a $400 jackpot. The highest of the game however, lies on the 4 heroes of the game. Though they may pay quite low individually, they are wild multipliers. They have the capability of wild symbols along with multipliers to make their rewards even more stunning. They also have a feature where they can stick to the reels for a re-spin, giving you a chance on the $100,000 jackpot of the game. Visit a Nordic Battle with the Nordic Heroes slots, which will give you a jam-packed hero action experience from IGT. It has amazing features, graphics and audio empowering its superb dimension and what's even more enticing is its $600,000 jackpot up for grabs. We encourage you to play the 108 Heroes Multiplier Fortune at Jackpot City Casino. You'll certainly make the most out of your time, effort and money by playing this rewarding game in this site, as they deliver you superb amount of promotions from 100% match-up to $1600, no deposits bonuses, free spins bonuses and more.